And remember, anyone can enter the contest, no matter what round we are on (FICTION WORKS ONLY, PLEASE targeted for the major trade market. No short stories. Magazine stories, board books, or nonfiction titles. See our FAQ for more info about that.) So if you’ve just come across the RLGL contest and see that round 15 just opened–SUBMIT! Kissy sends submissions back all the time so tons of people are starting from the beginning with every round. So get in the game whenever you can! As always, you will receive feedback (brief feedback, of course, so we all can maintain our sanity over here, but feedback nonetheless!) on your entries, regardless of win! This year, we will award one lucky PB or Early Reader writer, a free phone consultation from myself and Kissy… and one lucky writer of a longer work (CB, MG, or YA), a free phone consultation as well. These babies are precious as I’ve been heavily involved in some very cool projects that are sucking away all of my time. So consider this a rare opportunity! This means you will also get to talk to me in person and my pooch Kissy about your work for a long, grueling 30 minutes! Will you survive such a thing?! We hope so. To win RLGL for your category, you must clear all of your manuscript pages for a PB/ER. For a longer work, you must clear at least 8 pages of your manuscript. Also for those who don’t know, Kissy, who joined my team a few years ago, is all about helping people get quality children’s stories published. This year, more than ever, he is on the lookout for some great manuscripts! Should something come under Kissy’s nose that is of interest, he will send it straight to me with just one wag of his tail. In other words, if we find something we can’t pass up, we are offering an opportunity to be considered by either my agent Jennifer Rofe with ABLA, or a mystery publisher should your work be selected for referral. You do NOT have to win RLGL to be considered for referral. You just need to submit something Kissy thinks could be a great match for her agent or a publisher we have in mind. If your work is selected, you will know as Kissy will personally email you about this and ask if you would like to be referred. Please don’t ask Kissy or me who the mystery publisher is. It’s a mystery and will remain as is unless your work has been selected for referral. At that time, you will know! Finally, we all know that RLGL is not about the prizes, it’s about the feedback, the tension, the craft, and the glory of sneaking 125 – 250 words past Kissy’s little sniffer before it becomes lunch! All submissions must be made via Submittable. We’ll show you how if you remember what we said and READ THIS WHOLE POST IN FULL so we can get to that part. All submissions should be formatted in Word or RTF so that your submission “sorta” looks like an actual manuscript, with some exceptions, so we can keep track of your story. Use the template provided. Here’s a nice little screenshot of the template and the actual Word file follows for you, so use it! BTW, if you need a bigger view of these screenshots, just give ’em a click. You can not submit ahead. Meaning if you are on Page 1, you cannot submit Page 2-5 to us at the same time, thinking we’ll just read ahead. We won’t. Instead Kissy will reject your submission for breaking rules–something you all should get used to because this happens in the real world too. (For example, if a publisher only asks for 25 pages, you don’t send them 40, yes? Stick to the rules!) If you leave to go on a vacation or you missed a deadline because you cracked your chin and lost a tooth, too bad. You cannot fast-forward. Instead, just enter the next round when it is open and continue from there. If you were on Page 3, for example, and you passed, submit Page 4 in the next available round you can get in on. If you were rejected in the last round you were in, start over with a new work in the next available round. Do NOT email Kissy asking for exceptions. He won’t answer those requests, even if SOMEONE CROAKED. And if that happens, you probably should be mourning and not playing RLGL anyway. Also you should not submit to a round, unless you have heard back about the round you were last in. In other words, wait for something from us each round, before you move on to the next round. Always start with the first 125 words of the work and go sequentially from there for the next 250 words, then the next 250 words and so on. Do not send us material that is in the middle of your book – would you do that to an editor or agent when they see something for the first time? Nope. So don’t do it here either. Works that are currently under serious consideration by an agent or editor DO NOT qualify for RLGL. However, if the work is on submission but you haven’t heard anything about it that would indicate an editor or agent is interested, that work is OKAY to submit to RLGL. We don’t want people one-upping others with works that are either 1) under contract or 2) have already piqued interest from agents or editors and you’re just waiting to hear back. We want to see the stuff that you really care to have feedback on, not stuff that you feel could be in the bag. In other words, don’t waste Kissy’s precious time, by having him chew up something that doesn’t need to be gnawed on that much. You can, however, submit work that you’ve sent in to RLGL before so long as it has not already won RLGL and that it has been significantly revised since the last time you sent it. In other words, don’t bore Kissy with stuff you’ve sent him before (written the same way) AGAIN, you wouldn’t do that to an editor or agent so don’t do that here, either. Wait for a new Round to open by watching for a new post on www.writingforchildrenandteens.com. Re-read the rules again, which will appear in that post to be sure you’ve followed the rules. Then click the Submit button that will be at the bottom of that post. 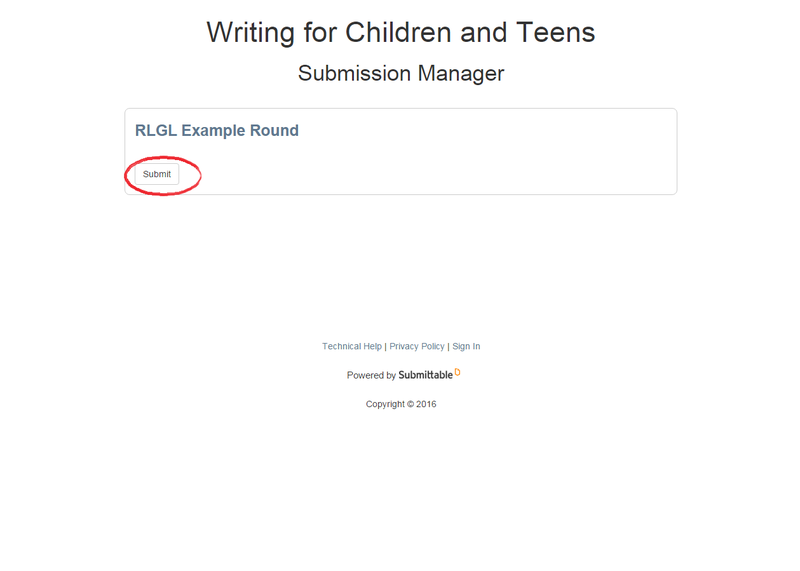 Click the Submit Button for the Round that is open (for the purposes of illustration, it says RLGL Example Round, but in real life it will say, RLGL ROUND (and then the number for that round), as well as the start and end times for that round). The first time you submit, you’ll be taken to a page to set up a FREE account and it will look something like this: *** Note: even though you will be adding personal info here (like your name), that will all be hidden from us when we look at your submission. Add in your MS Title and select your MS Format from the drop down bar. Save the Word or RTF file that you want to submit with a name like this: “FORMAT My MS Title”. (e.g. PB KISSY LOVES BACON). That way when Kiss downloads the file on his laptop, he can find it easily and does not mistake your Word/RTF file for someone else’s. SUPER IMPORTANT. Click that Submit Button at the bottom. CONGRATS! 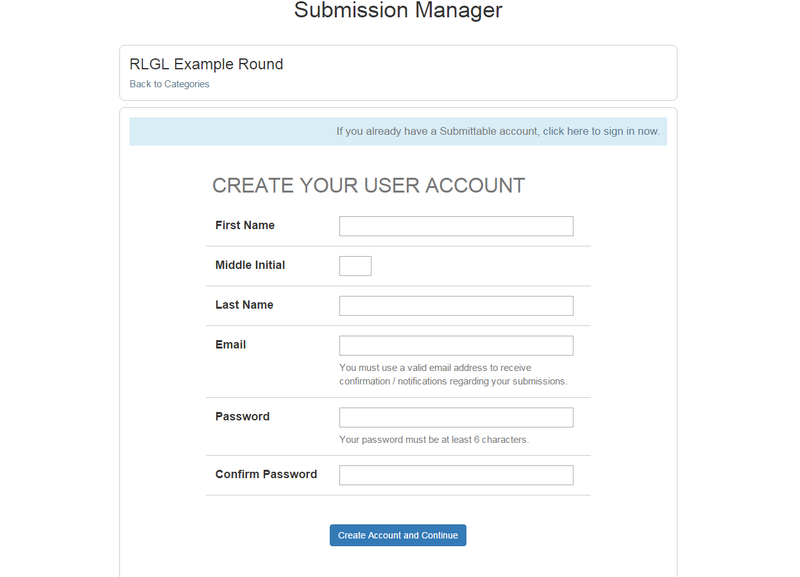 You’ve just submitted to RLGL! Wait patiently for your feedback. Please don’t ask us personally about when you will get your feedback returned. If however, you see a new round open, and we say we’re done with feedback but you got zippo from us, then email us at kissyRLGL AT GMAIL DOT COM. Dust yourself off. Select a different MS of yours to enter into the contest. Create a NEW document for your new MS entry using the RLGL Document Template. Wait for the next round to open and give us those first 125 words from the new MS and proceed from there. You’ll title those next words in a next section like [PAGE 2 – NEXT 250 WORDS]. This is where you will paste the next 250 words. If you need a visual for this, look back at the RLGL Document Template. Wait for the next round to open to submit your work. Good luck with RLGL. Don’t give up. Revise every line of your MS before you submit. Remember, this game is a lot like the real world out there. You only have so many words, so many lines, to keep your reader engaged. Don’t get lazy. All you’re trying to do is write, revise, and find that perfect match! QUESTIONS? Post them publicly here by commenting on this post so others can see, and we don’t have to answer the same thing over and over again. Thank you! 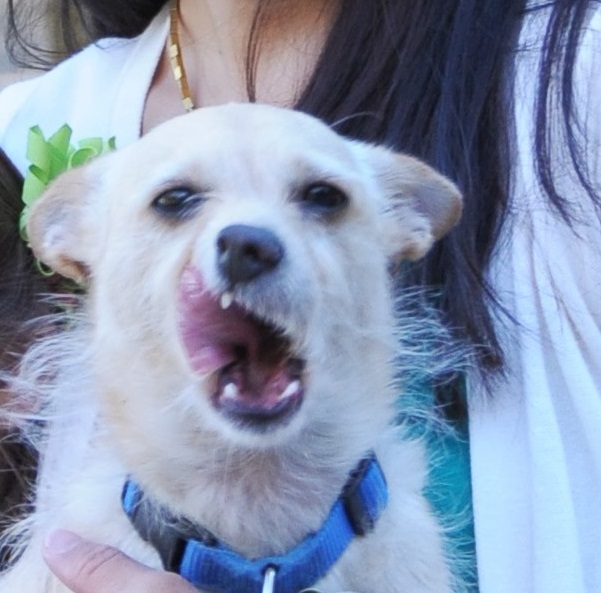 However, if you have a PERSONAL question for Kissy, you can send him an email here: KissyRLGL (AT) gmail (DOT) com. Kissy is going to have a lot of manuscripts to chew his way through so be patient if he doesn’t answer back right away! Now stay tuned. 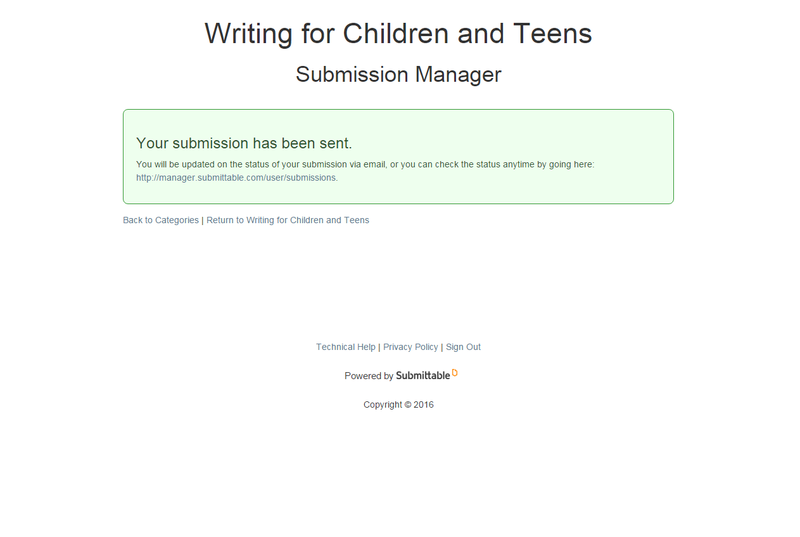 The next post that will appear here at www.writingforchildrenandteens.com will open the first round. Be sure to tell your writer friends what is about to go down and have them watch this site right along with you to join in on the action! Q: How does Kissy feel about looking at entries when the writer has a different MS under serious consideration with agents (meaning full requests)? A: If it’s a different ms that is under serious consideration, that’s okay. We know all too well that the same writer can produce manuscripts of varying quality and fit for any given editor or agent. So we take that approach as well to RLGL. If you have PUBLISHED BOOKS, you still could use a little Revision 9-1-1. (Just ask Cynthea’s agents and editors.) So … if you’re a published author, we don’t care. Send us the work that you want Kissy to sniff at. The work qualifies if THAT particular work is not under serious consideration by agent or editor. 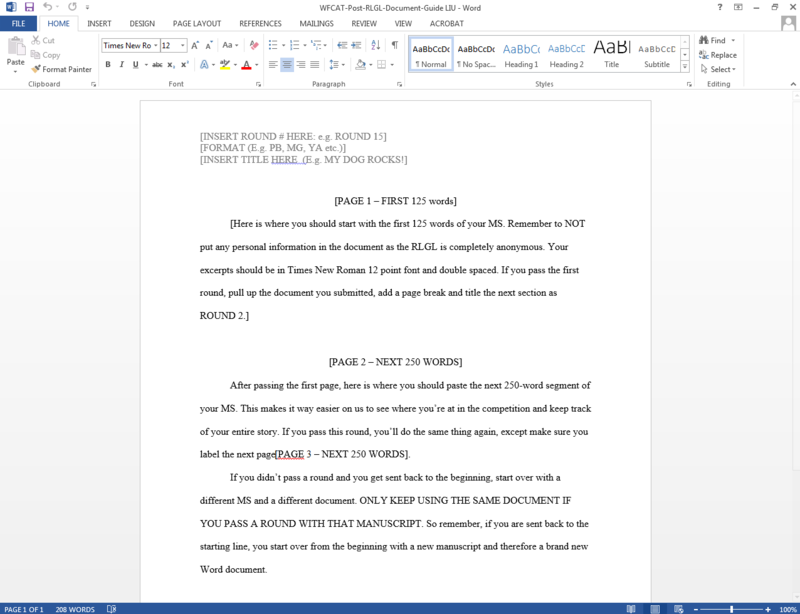 Q: So when round 1 begins, I should send a document with only the first 125 words? And for round 2, I would add the next 125? A: The template makes it clear, we hope! But it should be first 125 words, and if you pass that page, then you would ADD the next 250. The reason why that is, is this: When you submit a real manuscript and you are following SCBWI guidelines (more or less), that first half page is about 125 words. Then the next page is on average about 250 words. We want to make sure everyone has equal footing, too. So that people can’t shrink their fonts etc just to get more words on a page. What it should look like as you progress through RLGL is a continuous story with headers inserted between “pages,” just as shown in the template. Q: I’m trying to make sure I submit correctly; I work on an IPad in Pages, so I can save my document to google drive as a .docx file and upload it from there. Is that a file format (.docx) you are able to read? A: If you can upload your document to Submittable as a .docx file, that should work. However Kissy will not be going to any google drives himself to look at submissions so we hope you can upload it as a .docx file! Q: Are art notes for picture books included in word count? A: Good question! Art notes do not count in PB word counts in general in publishing and also for this contest! So do not include art note words in your word count. Q: What happens if I reach the end of my manuscript. Do I indicate the manuscript is finished somehow? A: Yes, indicate THE END at the end of the manuscript. That applies for any manuscript. Help us by saying “THE END” at the end of your manuscript. Q: Can we revise our document during the contest. For example, can I go back to previous pages and change stuff before I submit my next page? A: Once you submit something to us, you cannot go back and revise what you already submitted to us from previous rounds. We will not reevaluate the revised text and if we sense that you went back and changed previous pages, then that’s not really fair to other contestants. So no modifications of previously entered text. Q: How much of a stickler is Kissy? Do you want us to cut things off mid-sentence, or can we go a bit over the 125 word mark in order to finish a sentence? A: Cut it off mid-sentence. Fair is fair. Please do not go over the word counts prescribed. Q: I’m a writer/illustrator…125 words would include a few pages of my PB dummy…or is Kissy only interested in tasting text? A: Please do not submit illustrations. The story should (with art notes if needed) stand up on text alone. If your book, however, is completely images, then that would be a whole other ball game and not really fair to other contestants. These picture books do exist, but for the purpose of this contest, those works would not be able to be judged by Kissy even if they are really awesome illustrations. Q: What happens if I miss a deadline? A: If you missed a round, join in on any round that is open and start at page 1. Q: Closing submissions were yesterday, but new entrants can enter anytime? A: Yes, there may be situations where new people or even current people missed previous rounds and would like to join the contest. Because entrants can be sent back to start at any time, this also keeps the competition super interesting. So it’s not always the same set of people who are competing at the same time. Nor is everyone on the same page of his/her manuscript either, depending on when they joined the contest. Hope that makes sense. Personally Kissy thinks dogs should be invited to join at anytime too. But we’ve got plenty to look at already. Q: Where exactly will feedback be offered? My submission for Round 1 still says “In Progress.” Does that mean you haven’t gotten to all the feedback yet or have I fallen through the cracks? A: Yes, in progress means we have looked it over and have not rendered judgment OR we haven’t looked at it yet. Q: Are contestants able to see other submissions? Or are they for Kissy’s eyes only? A: Kissy’s eyes and mine and my intern’s. It goes to no one else and other people cannot see other people’s entries. Q: What kind of work can I submit again? 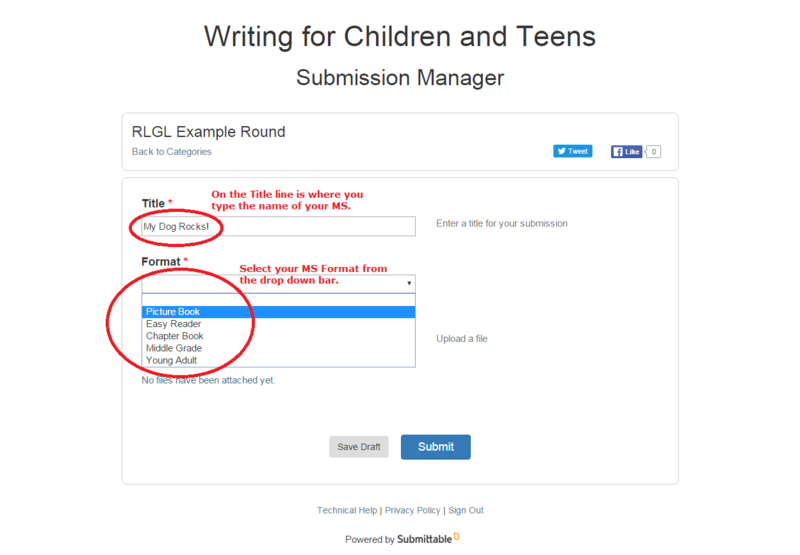 Works submitted to RLGL should be Fiction or Creative Nonfiction works meant for the PB, ER, CB, MG, and YA formats. We review work from the POV of a major trade publisher like a Penguin Random, HarperCollins, S&S, along with others like Candlewick and so on, who sell into schools, retail bookstores like Barnes & Noble, and indies. This is where Kissy has the most experience, and it is very different from looking at a work from an educational publisher, specialty house, or small press POV. If you have a magazine story, board book, or nonfiction work, do not submit it to this contest as Kissy does not have those particular hats on when reviewing your submissions. Also board books, by nature of their brevity, won’t work well for this contest and in general, are ghostwritten or written in-house, derived from a PB format or other work, or written by writers who are already established with a major trade publishing house. In other words, unless you already have an in, it’s tough to break into that market and/or get an agent with a board book manuscript. Magazine stories are not Kissy or Cynthea’s specialty, and this website is focused on major trade publication and NOT how to get published with Highlights, Cricket and so on which falls under the Children’s magazine market – which has its own market dynamics and considerations. So we don’t feel like we should be trying to advise people on their magazine stories. Do not try to force fit your magazine story into this contest. We can spot short stories versus PBs pretty quickly and you will get sent back to start. Finally, we will not look at nonfiction work either as that is a whole other beast to contend with and has it’s own unique qualities and styles. Creative nonfiction, however, is okay as usually it is the story itself that drives the work more so than all the other elements that makes good straight-up nonfiction, great. How does Kissy feel about looking at entries when the writer has a different ms under serious consideration with agents (meaning full requests?) Thanks so much for doing this, both of you! If it’s a different ms that is under serious consideration, that’s okay. We know all too well that the same writer can produce manuscripts of varying quality and fit for any given editor or agent. So we take that approach as well to RLGL. If you have PUBLISHED BOOKS, you still could use a little Revision 9-1-1. (Just ask Cynthea’s agents and editors.) So … if you’re a published author, we don’t care. Send us the work that you want Kissy to sniff at. The work qualifies if THAT particular work is not under serious consideration by agent or editor. Thanks so much! Good feedback is golden. Are art notes for picture books included in word count? Good question! Art notes do not count in PB word counts in general in publishing and also for this contest! So do not include art note words in your word count. The template makes it clear, we hope! But it should be first 125 words, and if you pass that page, then you would ADD the next 250. The reason why that is, is this: When you submit a real manuscript and you are following SCBWI guidelines (more or less), that first half page is about 125 words. Then the next page is on average about 250 words. We want to make sure everyone has equal footing, too. So that people can’t shrink their fonts etc just to get more words on a page. I’m trying to make sure I submit correctly; I work on an IPad in Pages, so I can save my document to google drive as a .docx file and upload it from there. Is that a file format (.docx) you are able to read? If you can upload your document to Submittable as a .docx file, that should work. However Kissy will not be going to any google drives himself to look at submissions so we hope you can upload it as a .docx file! Yes I definitely can do that, thanks! I’m confused. Do I only submit the first 125 words and then wait to see if I submit more? Yes, you wait to see if you can send more. You will get a result in your inbox once your manuscript has been reviewed. are contestants able to see other submissions? or are they for Kissy’s eyes only? Kissy’s eyes only and mine and my intern. It goes to no one else and other people cannot see other people’s entries. Hi first Kissy thanks for this great opportunity and my question is what if your manuscript only totals 214 words do we indicate the manuscript is finished in round two ie The end of manuscript?? Yes, indicate THE END at the end of the manuscript. GOOD QUESTION. YOU SHOULD PLACE “THE END” ON YOUR MANUSCRIPT SO WE KNOW IT IS THE END. Can we edit our doc before the deadline? Not sure what you mean? Once you submit it, you cannot go back and revise what you already submitted. We will not reevaluate the revised text and if we sense that you went back and changed previous pages, then that’s not really fair to other contestants. So no modifications of previously entered text. Cut it off mid-sentence. Fair is fair. Please do not go over the word counts prescribed. Thank you! No pictures. The story should (with art notes if needed) stand up on text alone. If your book, however, is completely images, then that would be a whole other ball game and not really fair to other contestants. These picture books do exist, but for the purpose of this contest, those works would not be able to be judged by Kissy even if they are really awesome pictures. Oops…Looks like I missed the deadline. I only just heard about this. If you missed a round, join in on any round that is open and start at page 1. If we accidentally label our header as round one when we meant to type round two should we “withdraw” that document and resubmit a new document with the correct “round 2” in the header? We have no idea how many rounds there will be. Or how long the RLGL will take. So hang in there. We are trying to speed this up for everyone. We are hoping that a round on average takes about 1 to 2 days to get through. That’s the goal. We’ve just instituted codes to help expedite the feedback process! Submittable also takes longer to go through than emails like we used in the past. However, it does help Kissy stay far more organized. And it gives the submitter the ability to see for real what the status of the ms without having to ask him. A huge bonus on our side! I am really confused! I was notified that I needed to indicate the format of my book in my MS according to the template. I’m not sure exactly what that means. When I submitted it, I couldn’t use the header part of the template because it was read only, so I typed the information directly into the body of the submission, along with the first 125 words. Since I got the message about indicating the format, my more computer literate son helped me change the header to my submission, and I hope I’ve done it right. But I don’t know how to resubmit. Am I unable to find the place to submit it because submissions aren’t open at the moment? Also, assuming it does open up again, do I submit it under “Round 2” again, since that was the original round I submitted in, or “Round 3” since that is the new round? Sure hope this makes sense to you! I’m sorry if I missed this (first timer here), but where will we find feedback? Thank you! Also, the info on typing THE ENDwas mentioned after I’d already submitted. Do I add it and start a new story for the next round? Hi there, I’ve cleared my PB and made it to Round 3! I wrote ‘THE END’ a the end of Round 2. I assume I just start Round 3 with a new manuscript? Ummm perhaps this is a dumb questions as an agent/editor would say NO…but for the longer works, can we send in unfinished manuscripts? I’d love to see if my new YA has Kissy appeal! Thanks! I see “Round 7-Longer Works is OPEN” and “New entrants may enter anytime.” I’m brand-new to this. Do I enter my FIRST 125 words in round SEVEN or wait until another round ONE appears? I assume my answer is in the first paragraph: “if you’ve just come across the RLGL contest and see that round 15 just opened–SUBMIT!” So I’ll submit. Yep, feel free to enter your work in round 7 as long as it’s a chapter, middle grade, or young adult book. If you have any questions, please let me know!